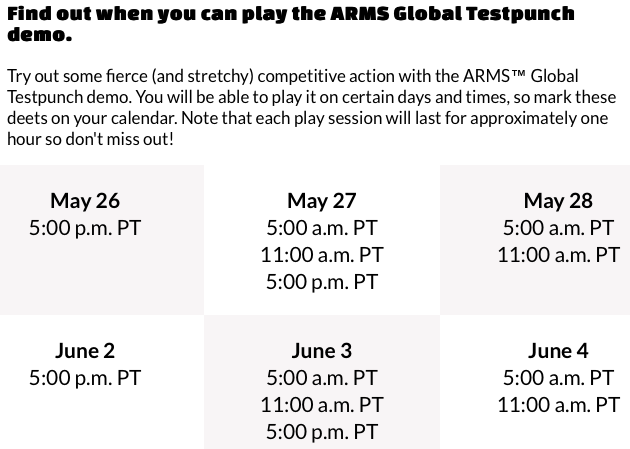 So the global testpunch is on 27th - 28th May and 3rd - 4th June, unless you're in North America then you can also play on 26th May and 2nd June! (Lucky Americans...) I'm glad Nintendo have started having these demos before the release, a good chance to see whether the game is for you or not. Especially with a new franchise like this. With arms made of springs, no wonder they call him "the bouncer"! At first glance it's hard to take this guy seriously, but in ARMS he always takes center stage. He can perma-charge in a pinch, and that indomitable spirit is gonna take him right to the top! Hailing from Ribbonics Records, it's "the airess"! She can jump over and over without touching the ground, like she's dancing on air! If she wins the Grand Prix, she's promised her fans a championship concert in the ring! Currently training at Ninja College, or as it's officially named, Rasen Ninjutsu University. The ninjutsu techniques of this "student of stealth" allow him to disappear into thin air and make fools of his opponents! The ARMS Grand Prix doubles as his senior project, and that challenge is the one thing he won't hide from. A member of ramen royalty, she hails from the famed Mintendo Noodle House! Her spicy kicks are known to knock down her opponents' attacks. Can her fiery personality bring the championship belt home to her family's restaurant?! This youthful ARMS superfan honed her engineering genius working at the local scrapyard. She wasn't born with stretchy ARMS, so what choice did she have but to build a fighting suit herself? When she rides it into battle, she can even hover in midair! Can she soar to the top of the ARMS Grand Prix she's always loved?! An experiment by ARMS Laboratories, the leaders in ARMS research! In addition to his arms, his whole body is stretchy—and his signature ARMS are just as weird. He's secretly entered the Grand Prix to prove the merit of the lab's latest research! A top snakeboarder turned ARMS fighter, this kid lives for the streets! All that boarding has really strengthened his legs, giving him a super-quick dash after charging up. He entered the Grand Prix to get more hits on his snakeboarding vids, but his natural instincts might just carry him all the way to the top! The duo of police-robot Byte and dog-robot Barq makes for an intimidating beach-patrol team. 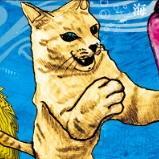 In the heat of battle, Byte is known to take a big leap off Barq and rain down punches on opponents! But if they win the ARMS Grand Prix, who's gonna patrol Buster Beach?! The mega celeb, star of the silver screen tries her hand...er, hair at the ARMS Grand Prix. Not content with her acting awards and accolades, she's going to use those stretchy silver locks to take the ARMS title! Oh, and while she's charging up, her actress aura can slow down incoming ARMS! Head of the ARMS League, the organizing body of the ARMS Grand Prix! You'd never guess his age once he charges and pumps up that beefy body to maximum buffness. As reigning champ, he awaits new challengers in the championship round of the Grand Prix! This sweet-dreamin' clown has traveled the world as a street performer. With her well-honed clowning skills, she's developed crowd-pleasing maneuvers that confuse and confound opponents! She hopes to one day open a circus of her very own, and the prize money from winning the Grand Prix could make those dreams come true! I'll add more info to the more recently announced characters when they're shown off more. There's one character that people seem to be particularly interested in and that's Twintelle. Plenty of articles to choose from if you need to see more. 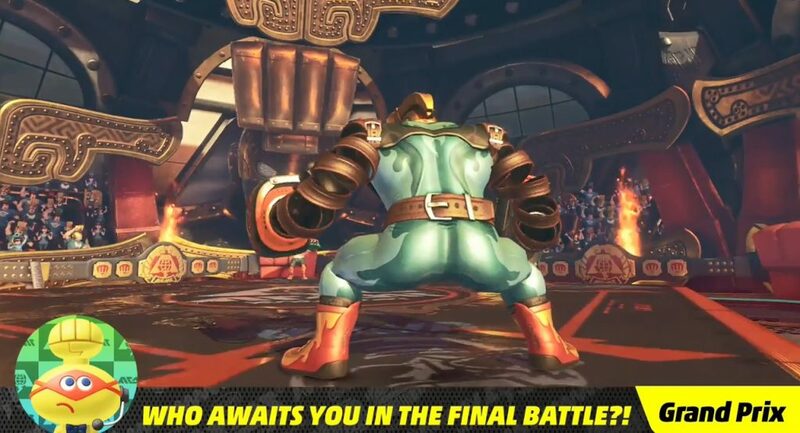 But yeah, I'm looking forward to actually trying the game in the upcoming testpunch. I hope others are too! 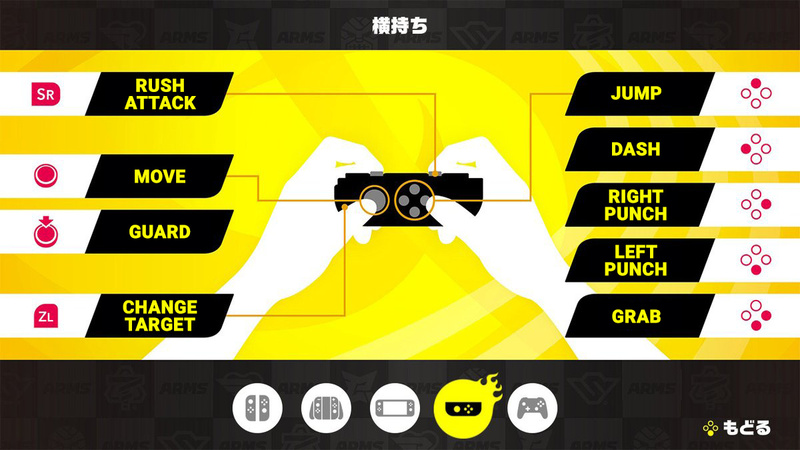 You have 5 controls schemes available in ARMS. If Motion Controls aren't your thing (or your arms are tired), how about trying one of the other ones? This is the classic scheme for ARMS and the one the game is seemingly built around. Definitely give it a whirl! If you want to take your Switch on the Go and want to be more discrete when playing, this is the way to go. 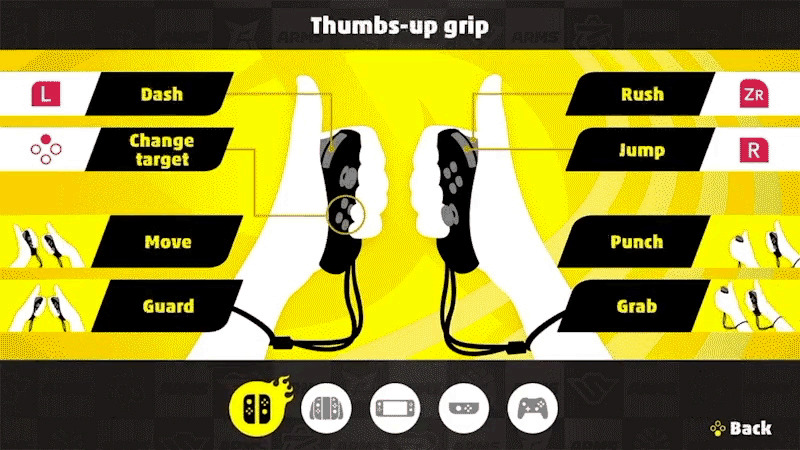 Similar in style to the thumbs-up grip, just without the motion controls! For those who crave that standard controller style. This is great for when you want to some instant multiplayer action, without having to buy anymore controllers! The most traditional style of controller, great for those who have this controller shape ingrained into their mind. As you can see, you have a lot of choice when it comes to how you want to play. 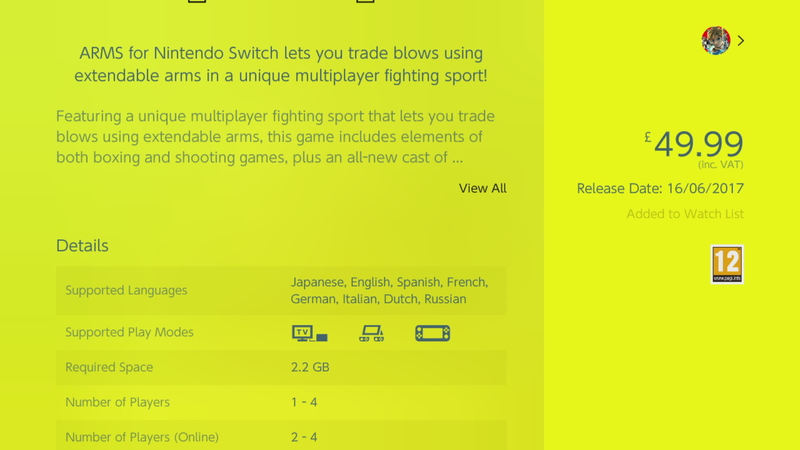 ARMS will cost £49.99 off the eShop and comes in at 2.2GB which is actually pretty small. For comparison Breath of the Wild (pre-updates) is 13.4GB, Super Bomberman R is 2.1GB and 1-2 Switch is 1.3GB. Reviews are coming in now, with an average of 77 on Metacritic (as of 14/11/17). So that's a very solid score that ranks it up fairly high when compared to other Switch games. Of course, scores are a bit arbitrary and meaningless so here are some quotes from reviews. 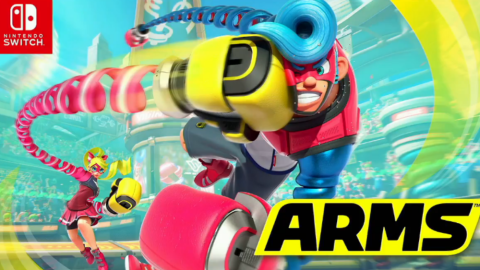 Nintendo Life wrote: ARMS is polished, addictive, immensely rewarding and - perhaps most important of all - establishes a solid platform to create a popular and long-running series. Game Informer wrote: Arms is a zany fighter that delivers excitement and fun at every turn. While I wish there was more to do, what is included in the package is worthwhile. If you're looking for a fresh and exciting experience to play on your Switch, Arms is worth a look. Polygon wrote: Arms exudes a level of creativity and mechanical sophistication that feels uniquely Nintendo. It evokes memories of classic Nintendo games like Punch-Out! !, while also feeling equally fashionable and modern — and set next to Splatoon, suggests the publisher is already charting a path toward the future. With a stylish, memorable cast of characters, inventive gameplay mechanics and smart use of the Switch hardware, Arms already feels like Nintendo's next great new franchise. Destructoid wrote: It works as a fighter, I just wish there was more to do in this debut entry -- both pragmatically in terms of modes and on an emotional level, as I haven't really connected with its universe yet despite its raw style. 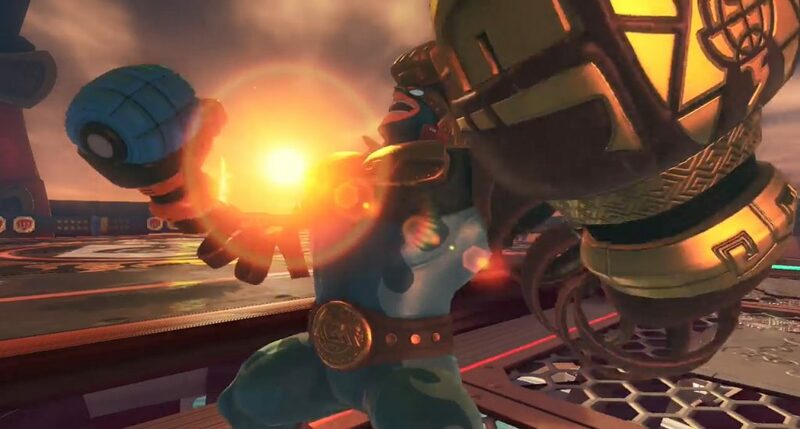 IGN wrote: Arms’ clever take on boxing provides a simple premise with a startling amount of depth for those who would seek to master the stretching appendages. Its rapidly evolving lobby system had me sticking around for “just one more match.” There may not be a lot worth unlocking right now, but planned free updates may just give Arms some additional legs. Digital Spy wrote: Nintendo has produced a game which is occasionally elating, often frustrating, but which definitely feels like nothing we've tried before. 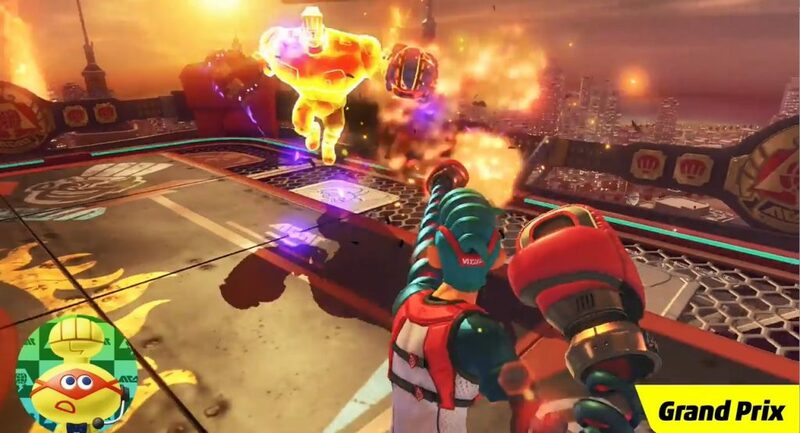 Assuming you're willing to overlook its flaws, ARMS could be a welcome addition to your growing collection of Switch games. VideoGamer wrote: Arms isn’t really a fighting game, but the aim is to pummel your adversary in a best-of-three match-up. It can serve up methodically paced clashes between two competitors, and absolute car crashes when you introduce a third person into the mix. 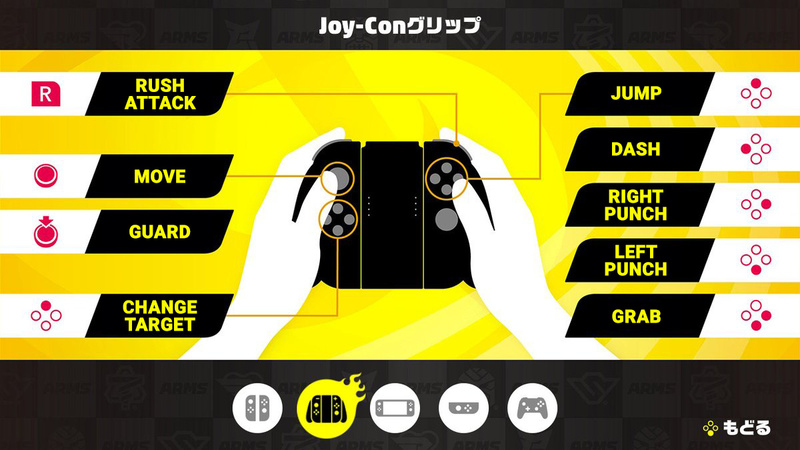 Using the motion controls allows you to finesse your jab, yet swinging your Joy-Con around the front room is more trouble than it’s worth. Arms can dole out a battle of wits one minute, and a frustrating button masher the next. Yeah, Arms is a strange beast. Last edited by GuitarHero on Fri Dec 22, 2017 8:20 pm, edited 40 times in total. Getting the attention it deserves. Nicely done GH. I was sold the moment this was revealed. Makes me sound crazy but it's true lol. I instantly fell in love with the way it looked and sounded. You could tell it was from the MK team just from this. After more hands impressions were out there I started to realise how much depth there is to ARMS. After the latest Direct I think it's pretty clear now how deep this can get. With more Arms and Characters being added as updates, Nintendo are going all in with this which makes me more than happy. Looks the new Fighters revealed won't be playable for the Test Punch which is a shame. Ribbon Girl was gonna be one of my mains before Twintelle showed up so it's not so bad. Mine is on preorder too! Any idea on the timings of the testpunch? 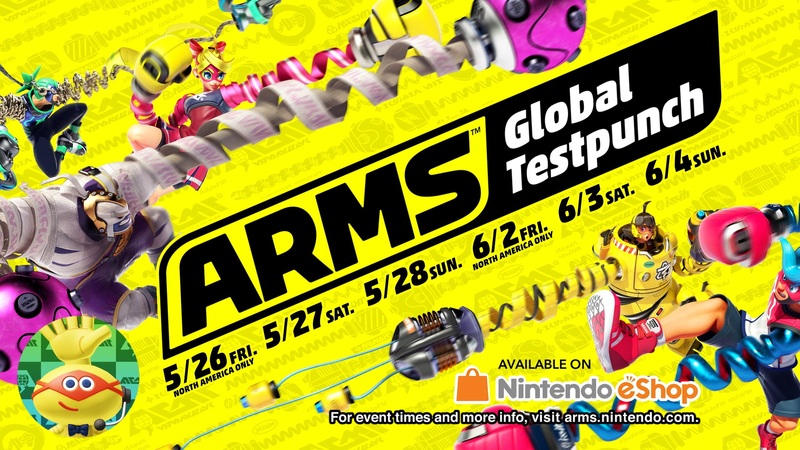 Going to try the testpunch next weekend, not been on my Switch much lately despite still having Fast RMX to finish, so any excuse to try it is a good deal in my books. It says that these will last about an hour each, so make sure to download the Test Punch prior to starting! Also the Test Punch will be 1.4GB in size. From the front, from the back and an action shot. Don't think we have a name as of yet. Hopefully he becomes playable in some capacity after beating him. Thanks, thought we needed a thread for this game now its just around the corner. Excited to actually try and get gud at a game for once! 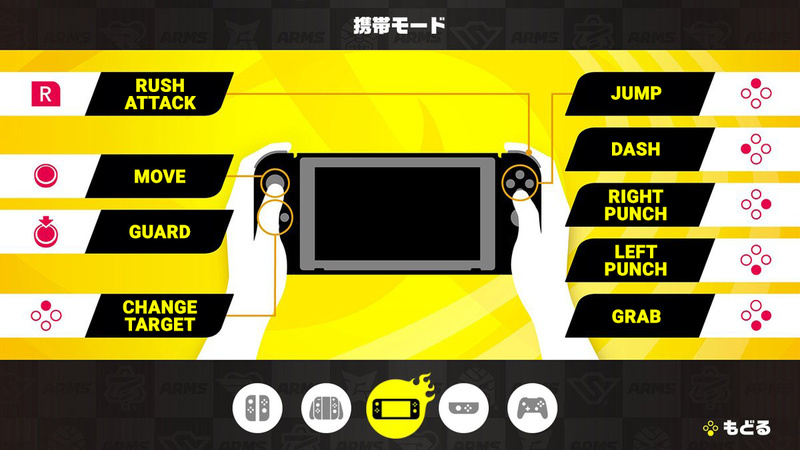 Yeah, there seems to be some confusion as to what characters will be playable, as that Japanese Twitter Post suggests just the first 7 characters will be playable, whereas the eShop (or I've the NA one says at least, haven't checked our's) states that you get the chance to try out all 10 characters. I'm more likely to believe the twitter post however, as I suspect that's the most recently updated thing about it. Haven't properly checked the times yet but now that I have, looks like I'll only be able to catch the 7pm times. I finish work at 7 on Saturdays so I barely might get a few matches in by the time I'm home. I'm okay for Sundays tho. Oh and something I forgot to mention is that some of the other modes will be in the test punch, or at least the V Ball game is. That looked fun, so happy to try that out too. Source. Great work on the OP GH! These are the 3 maps we're going to have on rotation for at least the first weekend of the Test Punch: Spring Stadium, DNA Lab and Ninja College. Hopefully we'll get some different maps for the one the weekend after, but I'm excited for DNA Lab as I want to try out curving the punches around those pillars as we've seen in the trailer. we now know the game will cost £49.99 off the eShop and comes in at 2.2GB which is actually pretty small. I'm still personally gonna go for the Physical release (not least because it will be cheaper), but good to know it won't take up much space. I've been wanting more time to play this since the January event, as everything we've seen has been good for it. Definitely going to try and get on for as many of those tests as possible. I'm not much of an arena fighter person, but am willing to give this a chance since I liked what I played before. eShop Test Punch page is saying first one is at 1am 27th. Will have to miss it but just giving a reminder to those that can catch it. Lemme know how it goes dudes. If I can jump on I'll be restricted to handheld mode for the first play. I'd like to jump on other times to give the motion controls another bash, so I'll see how it goes. Might have to skip this global test punch unless I can do button only controls. One of my arms isn't exactly feeling great right now. Yeah you're right, I must've misinterpreted one of the press releases or they changed it since! As they all said North America only on the 26th but that must have just been to timezones. I'll update the times. 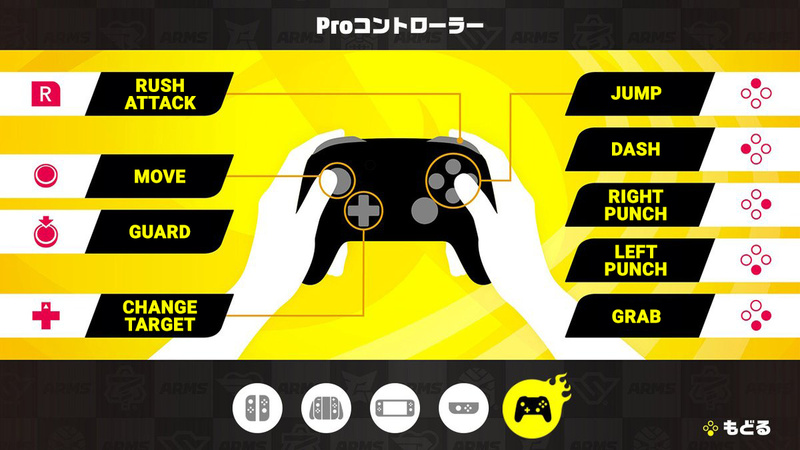 You should be good trying out the other modes: here's a comprehensive guide of control schemes. Absolutely gooseberry fool poor. Game controls like eton mess and I managed to get about ten full 90 second games in without the connection going kaput. Ribbon Girl is the best. Super looking forward to this - the one-on-one fighter to get on the Switch. Hope the testpunch shows the game's hooks, and that no-one gets too cross playing it. It's certainly as good as I remember, though I can see myself using motion controls more than any other scheme. After using motion for a bit, I decided to use button controls with both Joy-Con. The flaw is that there doesn't seem to be any way to actually swap from one scheme to another. So here I am, using two Joy-Con, and for whatever reason the game would just randonly confuse button actions. After three matches of struggling with it, I decided to just go back to motion controls. The rest of the game is perfectly fine. I had really good fun there, got in about 30 matches and ended on about 70 ARMS coins(?) so pleased with that. Had very little lag which was surprising. I've seen a few people say they enjoyed it much better after they switched from motion controls, but I had a blast with them though I can understand why they aren't for everyone. Might try the pro controller later to see if it's better. Tried out all the characters but had the most success with Ninjara after a while, seemed to flow better for me. Also wish there was a replay in this demo, as I had a great comeback with one bit of health remaining to take a clutch win. So satisfying. I rely too much on grabs though, so need to get better aim. The 1v1v1 matches weren't great though, I just ended up playing tactically after a while and just wait to swoop in the victory. It was also impossible to stop a grab after immediately grabbing one of the other people so it made sense to wait which wasn't so good. V-Ball was alright once I worked out how the ball worked. Needed to work on my punch aim though. Definitely going to hop back in later, and looking like I will end up purchasing the game as well. Good times. Had a few games online, and boy am I terrible at this game. I won the practice match and the first before proceeding to get absolutely battered by literally everyone. Tried the motion controls and hated it so immediately went to a traditional control system. Stuck mainly with Ninjara but struggling to get the strategy down and took ages to work out how to do super moves. End result, everyone beat me. Pretty much this for me too! Although i should add that i did really enjoy playing too! Lots of fun and i did get better as i went, v-ball was good fun too. Looking forward to 7pm!